Big news – we are heading back down to La Paz, Mexico! We knew we needed to get back down and take care of our boat, but we were not sure about when we might be able to actually break away from the life we have been building in the Denver area. Money was also a big factor; as in, will we make enough in a short time to get our boat back in the water? It turns out, Tim was able to work a hail storm in Greeley, CO, selling new roofs to replace damaged ones. For those of you who didn’t know, Tim grew up in the roofing industry repairing and selling roofs for his parent’s roofing company in DFW. This work has afforded us the possibility of getting back to our boat for some TLC. 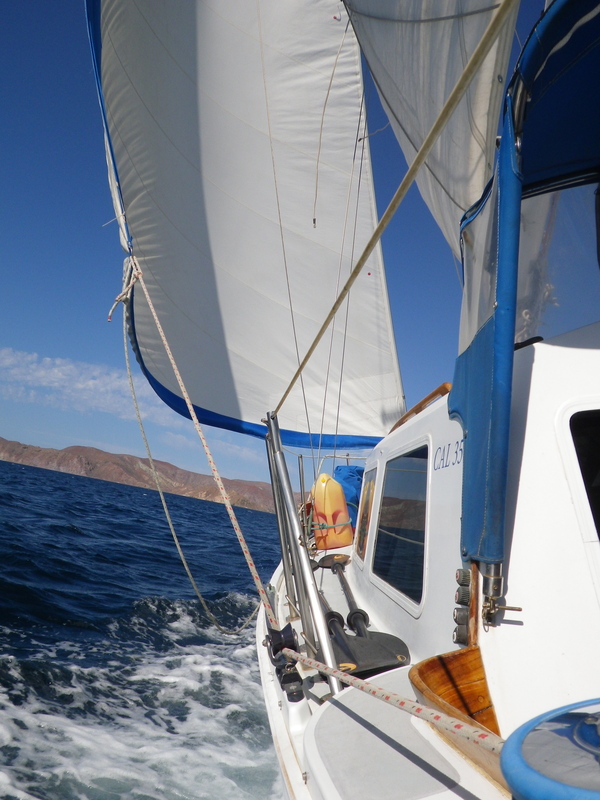 Our lovely Cal 35 sailboat has been stored on-the-hard in a boat yard in La Paz for more than a year. We did the typical seasonal shut down checklist, per advice from our sailing friends. This included removing all sails, draining fluids from the engine, tying down everything and protecting what we could from the damaging sun and bugs. This took us about four days to really secure her to be stored. We are anticipated about two weeks to put her back together. One reason we decided to go back now was to get our beautiful boat looking beautiful again. As I said in a previous post, we have decided to sell our boat. She has been on the market for a few months with a few showings under her belt. But when we left her, we hadn’t intended to put her up for sale, so we know she is not looking up to her potential. Hence, our trip down is two-fold: to have a last hoorah at the islands and to put a bit more work into The Luckiest to get her sale-ready. We plan to probably pay someone to sand down the previous layers of paint and barnacles and applying a fresh coat of barnacle-resisant paint to her underside – the anti fouling process. This also increases sailing speed, which is important when every knot counts. We will clean her up and get her sails back on, etc. Her house batteries are also ready to be replaced, so we are adding that in, too. All this, we do in hopes of selling her as this years sailing season approaches. 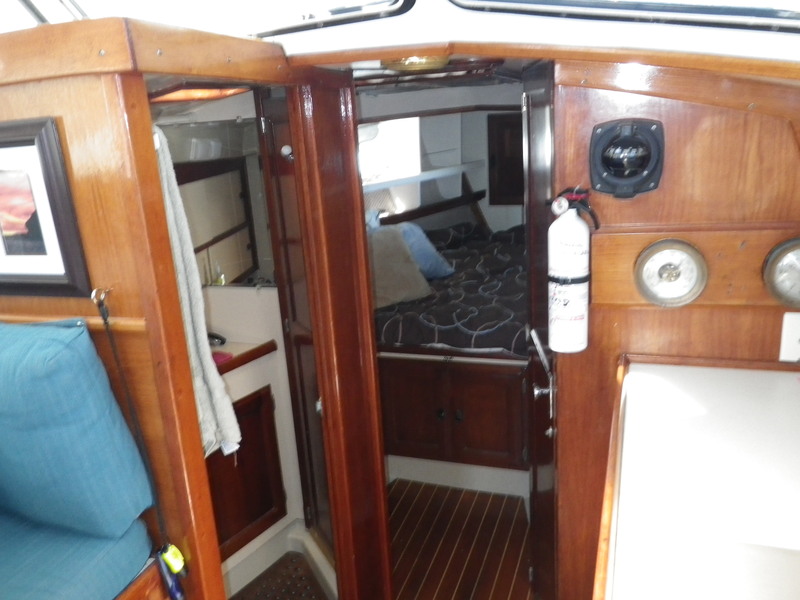 It saddens me to think about selling her, because she is a perfect cruising boat. But the truth is, we have to find a better balance of a traditional American lifestyle and one of travelers. It is a very hard balance to strike, and we thought we could do it by living on our boat for six months and in our small townhome for six months (sailors call it “six on, six off”). This plan isn’t really working for us because we have to work more throughout the year than say a retired person to keep ourselves afloat. We have tried to keep a minimalist lifestyle in the states with a small monthly budget to keep ourselves free of as many strings as possible. Because travel is a high priority for us, we still plan to set ourselves up for lots of it. More realistically than six months out of the year, we will have two to three months for travel yearly. This will take time and financial legwork, but we will get there. 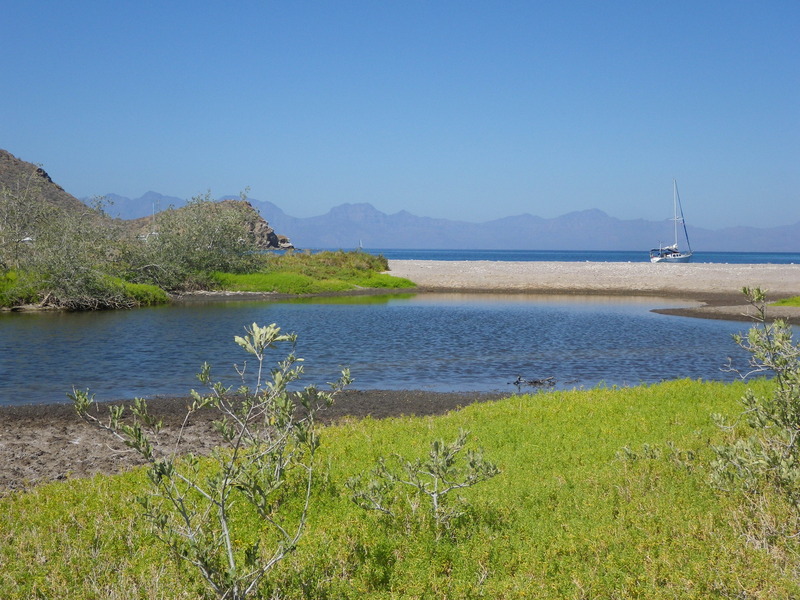 We love the sailing lifestyle and community – having made some dear friends in the Sea of Cortez. It’s likely that we will come back for more, just not on our own boat. Crewing on other’s boats is a big part of the sailing community, and we certainly would like to see more of the world via sailboat. For those of you who are interested, or might know of someone in the market for a Cal 35 with added sugar scoop, please share this listing info and blog post. As stated in the brochure, the ingenious and unique touches that Bill Lapworth has designed into the Cal 35 set her apart from other world cruisers, coming close to a perfect cruising yacht. Whether you’re anchored off La Paz in the Sea of Cortez or running downhill across the Pacific to Tahiti, you’ll live in style and comfort aboard the Cal 35. The interior finish is as practical as it is luxurious, beautifully designed with rich Burmese teak. With a full 6 foot 6 inch head room and a 7 foot long double berth, this is a great boat for tall people! The raised dinette allows you to view the scenery while dining below. The long water line, sleek hull lines and large 546 square feet of sail area give her great speed. And she’s easy to handle. The big modern spade rudder offers greater maneuverability and easier wheel steering control. The comfortable cockpit has benches long enough for sleeping outside as well. All mechanical and electrical equipment is easy to get at. Making repair and engine maintenance a cinch on the Perkins diesel and its fuel supply give you an 800-mile cruising range on power alone at 7 1/2 knots. This is an excellent cruising yacht! Sailing from Isla Danzante to Puerto Ballendra at Isla Carmen. We sailed all the way there with fairly steady wind and good speed. 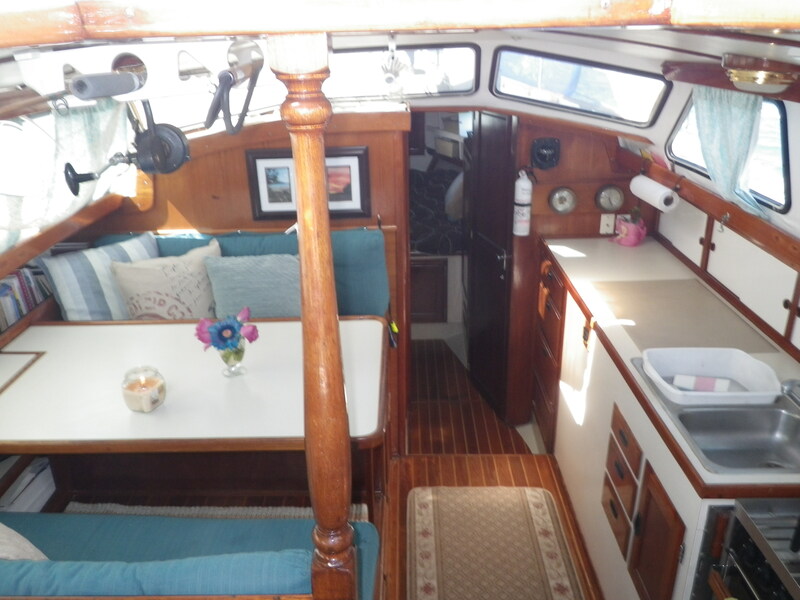 Our main living space with Galley to the right and dining area to the left. A peek into the v berth and head. 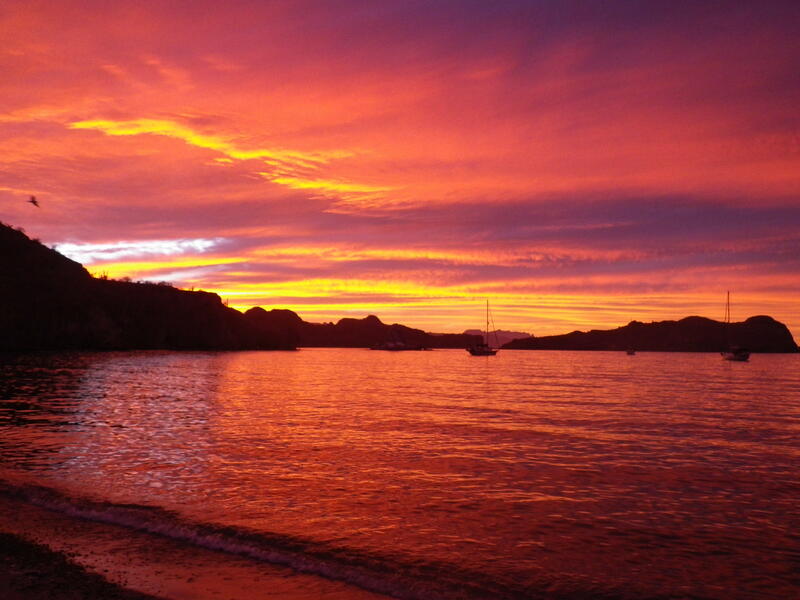 The amazing sunset from the south beach at Agua Verde. We saw some of the greatest sunsets ever. A view of our boat at the beginning of our long hike across Isla Carmen. I’m sad the dream has diminished. I was reliving my past through younger eyes. Good luck with the sale, its a premium vessel. At least this experience will be part of your life together. Brenda and I revisit our sailing adventures throughout our new found love RVing. We leave for the South next week. Aqua Verde is a great dive spot and for all the spear fishing I did, I only lost one spear and it was there when an eel decided he wanted my speared fish. Just about 4 years too early or we’d be interested in buying her:) Hope she finds a great set of new owners quickly!